Pembrokeshire Coastal Path0845 3457275work Walking RouteThe Pembrokeshire Coast Path is one of Britain's National Trails. There are 15 in England and Wales and they represent the 15 best walking trails. There are three national trails in Wales, The Pembrokeshire Coast Path, Offa's Dyke and Glyndwr's Way. What makes the Pembrokeshire Coast Path so interesting is the variety of landscapes you pass through on your way along it, ranging from steep limestone cliffs, undulating red sandstone bays, volcanic headlands and flooded glacial valleys. There are also some remarkably quaint towns and villages to explore, rest, refresh and recuperate in; essential for getting your breath back after experiencing some of those views! As far as possible the route runs close to the cliff edge and coast, but this is not possible at all times; on occasion the coast is barely in sight where the path detours round industrial or military areas. These deviations, however, are brief. 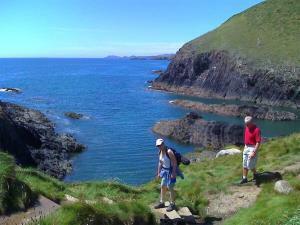 The Pembrokeshire Coast Path is one of Britain's National Trails. There are 15 in England and Wales and they represent the 15 best walking trails. There are three national trails in Wales, The Pembrokeshire Coast Path, Offa's Dyke and Glyndwr's Way. The walking is not strenuous, but there are constant undulations throughout, and there are narrow sections of the path. There are also many stiles en route. In its entirety the Coast Path represents a considerable physical challenge - its 35,000 feet (11,000 m) of ascent and descent is said to be equivalent to climbing Everest. There are two low-tide crossings, at Dale and Sandy Haven, which require lengthy detours if not timed suitably.